Click here to view other PhD studentship opportunities at Coventry University. 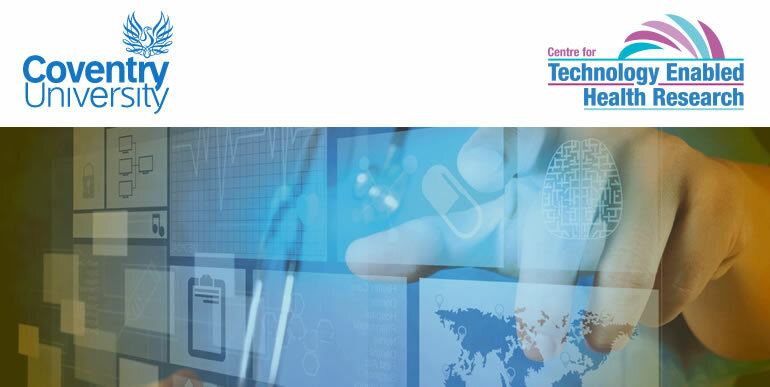 The Centre for Technology Enabled Health Research is offering a number of new PhD studentships to the highest calibre and most talented students. Please contact the Director of Studies to discuss the studentship you are interested in prior to making your application. Students with their own proposals, which fall within the interests of the Centre, must contact potential Directors of Studies to discuss their potential idea prior to submission. For an overview of the Centre’s research read our first Annual Report (contact Josh Elliott) or access the Centre website. Studentship A: The Social Return on Investment (SROI) of self-management support programmes. Studentship B: The role of social networks in self-management of long-term conditions. Studentship C: Development and evaluation of an online Mindfulness based stress reduction course for women with chronic pelvic pain: A feasibility study. Studentship D: Co-creation of an e-platform to provide social support for teenagers with developmental coordination disorder (DCD). Theme 2: Digital Technologies for Health and Well-being. Studentship E: Home hazard modification and falls prevention: a feasibility pilot with process evaluation and testing of an app to support behaviour change. Studentship F: Establishing and validating a visual arts-based mobile health solution to promote brain health and well-being in frail elderly. Studentship G: The involvement of disabled children and young people in decision-making within their EHC (Education, Health and Care) Plan under The Children and Families Act (2014). Studentship H: The experiences and needs of adult siblings of a brother/sister diagnosed with a non-inherited genetic condition as they reach parenthood. Studentship I: The use and outcomes of non-instructed advocacy with children and young people with complex communication needs. Studentship J: Post-partum experiences and needs of women with FGM following birth in UK maternity services. Studentship K: Young Disabled LGBT People (aged 16-25): Exploring the rights, identities and psychosocial needs of a marginalised community. Studentship L: The economic evaluation of extensions in the role of community pharmacists into non-dispensing healthcare services. Studentship M: Analysing the validity and appropriateness of the International Society for Pharmacoeconomics and Outcomes Research guidelines for measuring drug costs in cost-effectiveness studies. We offer experienced inter-disciplinary, national and international supervisory teams to support students to achieve excellence in their research. For Health Services Research, Coventry University was ranked joint 5th in the UK in REF2014 (UoA 3; Allied Health Professions, Dentistry, Nursing and Pharmacy) with 94% of our outputs recognised as World-leading or Internationally Excellent. The total number of studentships to be awarded will be decided following short-listing and interview, and is dependent on the quality of the applicants. For more details of the research areas and how to apply please click here. Knowledge and/or experience in the subject. A good knowledge of research methodology (qualitative or quantitative). Experience of experimental, modelling or analytical methods where appropriate. Application form, full supporting documentation and covering letter, plus a 500-word literature review relevant to the proposed study. UK/EU students with the required entry requirements, or international students able to demonstrate their ability to self-fund. A range of Full and Part-time, funded and fees only studentships are available. Duration of study: Part time and full time opportunities are available. Please contact the Director of Studies for each studentship to discuss. Application deadline date: Friday 26 February 2016. Interview dates: To be confirmed to shortlisted candidates.